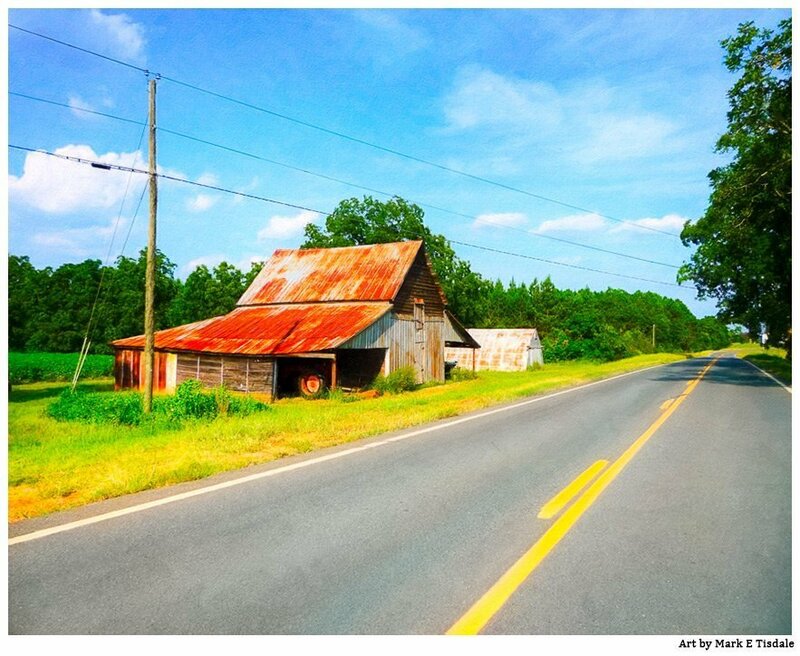 There’s just something quaint and charming about an old rustic barn and a country road. It’s the sort of scenic landscape that has spoken to us for generations. Even if the olden days weren’t as uncomplicated as they seem, when you see an old rustic barn in the midst of farm country it feels like the epitome of the simple life. It may be a symptom of rose colored glasses, but in the end, does it matter? If a few minutes looking at a picturesque rural farm print lowers your blood pressure in today’s complicated world, then I’m all for it! I’m sure that was part of the attraction to rural Americana for me when I was living in Atlanta. I loved to escape into the North Georgia mountains or roam the rural roads near my hometown in Macon County. And that was where I stumbled over this old rustic barn with its rusted tin roof and siding. Set as it was amidst the green trees beneath pretty blue skies… well, I had to pull over and capture this moment. There was simply no choice in the matter. It spoke to my heart as I’m sure it does to many of us. Capturing the spirit of the rural countryside was my way of taking it back with me when I lived in Atlanta. And I love that as an artist I am able to share that same sweet calm with others. This old rustic barn is the kind of scenic countryside art that I’m sure speaks to many from the American Southeast if not beyond. It’s the kind of place I grew up seeing near not just at home but on family trips throughout the Southern US. And I have no doubt it’s the type of scene that connects with people living in cities as well as those who can wander out the backdoor and enjoy this kind of raw beauty in person. I would love it if you take a moment to share just how this particular rustic barn print connects with you?